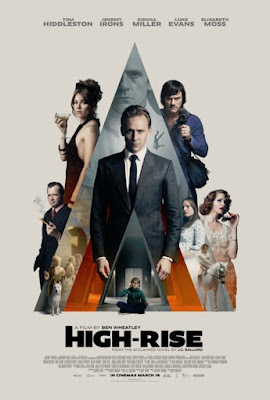 Note: This is a reprint of my review for High-Rise, which originally ran on September 21, 2015 after seeing it at the Toronto Film Festival. I am publishing it again today as it hits select theaters and VOD this weekend. 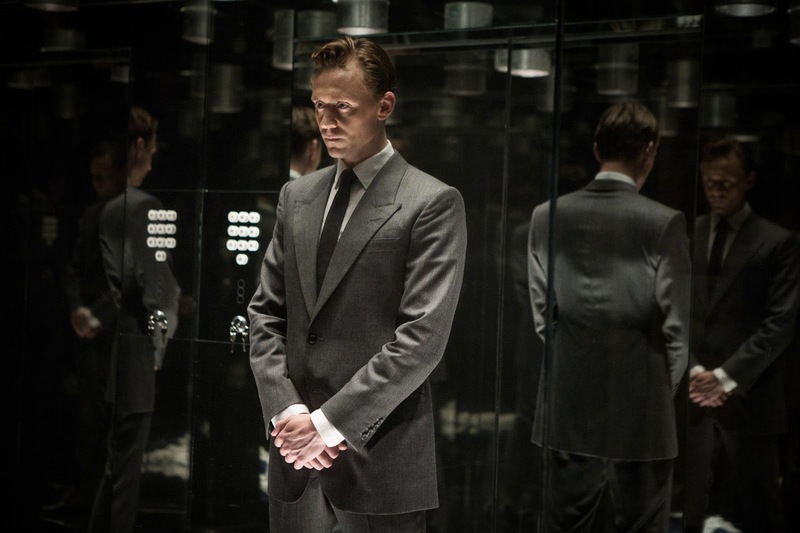 Where to even begin with director Ben Wheatley's (Kill List) latest, High-Rise, is beyond me. If ever there were a muck of a film that thrived on its look and style alone it would seem to be this one. Not even the charisma of insanely charismatic British actors like Tom Hiddleston and Luke Evans can save the hot mess this is, though they try desperately. From the outset, audiences are presented with a dystopic world of chaos and destruction that seems so disconnected from anything resembling familiarity that there is no urgency to care. Instead, this intended metaphor of social hierarchy is an aimless slog through the explanation of a failing system rather than any kind of examination of how social classes are commonly found in societies that are actually developed. All systems fail eventually, we understand that, but what we see in High-Rise is a society that never develops past the embryonic stages. It's always been something of a rule of thumb that a dominant hierarchy is necessary in order to maintain social order and provide a stable structure, but the folks who have created this luxury tower block seem to all want to live in luxury with no one invested in putting in the dirty work. Naturally, those living on the lower floors are the ones believed to be less worthy of their place in the tower and thus what eventually develops is an all-out dangerous social situation that leads the residents of the high-rise to fragment into violent tribes hell-bent on provoking one another into submitting to the other. While the circumstances of this premise would certainly turn into a rather disorderly situation in any film I didn't expect the film itself to do the same thing. Based on J.G. Ballard's "unfilmable" novel of the same name and set in London in 1975 we are first introduced to Robert Laing (Hiddleston). Laing is a young doctor seemingly seduced by the idea of the lifestyle in this new high-rise complex that is essentially a community cut off from the rest of society. Laing is also seduced by the mysterious creator of the tower, architect Anthony Royal (Jeremy Irons). Taking up residence on the twenty-fifth floor, Laing comes to discover a world of involved loyalties as he also strikes up a relationship with Royal’s devoted aide Charlotte (Sienna Miller) and her son. 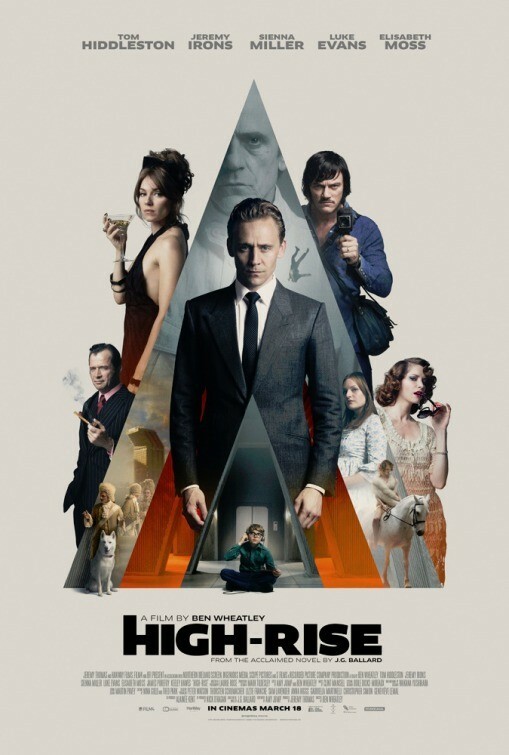 Eventually, the levels begin to meld and Laing befriends Richard Wilder (Evans), a documentary filmmaker who lives on one of the first floors with his wife, Helen (Elisabeth Moss) and their many children, who is determined to arouse the many injustices inherent in the high-rise. Robert Laing (Tom Hiddleston) is a young daughter who seemingly has it all. The rapid decline of the state of the high-rise, how quickly it happens and without any real justification gives it little impact on top of making little sense. Feelings of anger are inevitably evoked from the opposing classes, sure, but why it escalates so fast to this level of pure chaos is inexplicable. The fact that the high-rise is apparently cut off from society is never really explained, much less the reasoning as to why this is the case. And so, for the majority of the film the audience is left to wonder why no authoritative presence ever shows up to provide some kind of order. Even after we realize no help is coming from anything akin to a police force, the question remains as to why Royal never sets down any rules or regulations of his own. After all, this guy who is somewhat affectionately referred to as "the architect," would also be the supposed leader of the complex and yet his arc more or less makes less sense than his buildings rapid decline. Even more inconspicuous is why Laing spirals out of control at all. As things begin to fail, Evans' Wilder states that, "living in a high-rise requires a special kind of behavior." Hiddleston plays Laing as a neutral party though, never allowing the otherwise tranquil doctor to spiral out of control until it is what everyone else is doing, thus seemingly making it the only option for Laing as well. This isn't the main problem with Wheatley's film though, more it is that we never know if it is indeed because of the influence around him that Laing succumbs or if it is actually because the good doctor becomes so embroiled in the class warfare (which translates to who throws a better party) that he feels it necessary to throw away his comfortable bachelor lifestyle and promising career.